April 4 is Independence Day in Senegal. 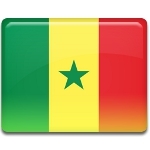 This holiday celebrates the day, when Senegal and French Sudan merged to form the Mali Federation in 1959. The Portuguese landed on the Senegal coastline in the 15th century. European powerful countries competed for trade area of Senegal, till France finally gained control over it in 1677. The French missioners introduced Christianity to Senegal and in the 1850s slavery was abolished. Senegal and the French Sudan formed the Mali Federation on April 4, 1959. The federation became totally independent from France on June 20, 1960 after long-lasting negotiations. The Mali Federation existed only for two months, due to the leaders of the Sudanese Republic in the federation mobilized the army. The Sudanese leaders retaliated, that caused a tense stand-off between the nations and withdrawal of Senegal from the federation. Although officially Senegal gained independence on June 20, 1960 the holiday is celebrated on April 4, on the anniversary of foundation of the Mali Federation.